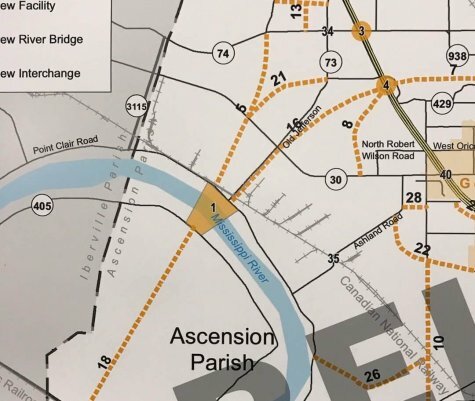 $800,000 worth of funding allocated in 2016, HNTB engineers assigned task of producing a long-range Transportation Master Plan for Ascension Parish was put on the back burner when a $25 million bond was retired, then re-issued to fund MoveAscension’s roundabouts and safety widening of select parish roads. The firm is back on task, presenting an update at the most recent meeting of Ascension’s Planning Commission. Safety-“Are shoulders up to standard,” he queried. Good luck finding any to measure. Population Growth-Where will it occur in the future? A 100-page report was condensed to one Fact Sheet for consumption by the Planning Commission. HNTB is working on Solutions in Phase II, then will present Alternatives characterized as “what is possible” for Ascension to undertake in fixing an intractable problem. It is going to come down to funding as in, there isn’t any to build adequate road infrastructure. Note the bridge envisioned across the Mississippi River from the end southern terminus of Hwy 73 in Geismar linking east bank Ascension to some cane fields in Modeste. How it, and other projects selected from a menu of 42, will be funded is anybody’s guess. Is there a billion dollars laying around somewhere? HNTB, hopefully, will propose viable funding mechanisms in Phase III though its cooperation with CPEX’s ongoing Master Land Use Plan bodes ill.
Is it just us or is there a tax proposal coming to a ballot near you in the future? HNTB’s focus on MoveAscension seems to have borne fruit. According to Assistant DPW Director (there is no DPW Director over him) Mike Enlow initiative will have $66 million at its disposal in coming years. That is up from the initial $36 million consisting of a $25 million bond issued by the parish and $10 million made available through Capital Region Planning Commission. None of the 42 projects identified by HNTB is a part of MoveAscension and must be funded separately. “Multi-modal is sweeping the nation,” he declared, admitting that Ascension is “five, or ten, 20 or 30 years away” from possible implementation. HNTB specified pedestrian, mass transit, and the moving of freight within “multi-modal” alternatives. HNTB is also working on a Floodplain Management Plan pursuant to a contract recently extended through the end of 2019. The plan in question was presented to East Ascension Drainage Board in May 2018 but delayed by Councilman Dempsey Lambert from his chair over the Board. “I think they’re gonna need all that time,” HNTB’s transportation engineer concluded.